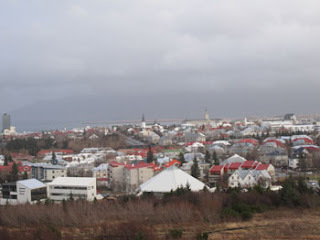 They have a saying in Reykjavik: “If you don’t like the weather, wait ten minutes.” Oddly enough, we had that same saying where I grew up in New York, and they have it here in Sussex, as well. 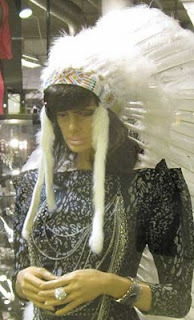 And I would bet a few thousand Icelandic Kronas (about two pound fifty) that you have that same saying where you live. 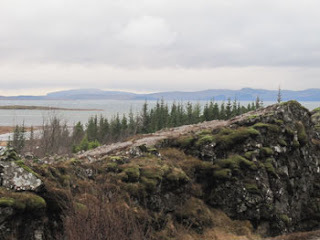 For the most part, the climate was mild and agreeable, and aside from sneaking the Northern Lights in behind our backs, the weather only caught us out once and, being British, we coped well enough. For a land with “Ice” in its name, that’s not too bad. 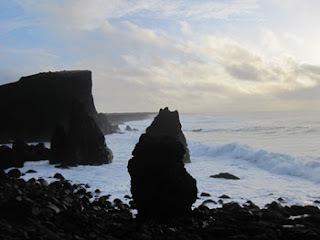 Iceland is a pretty country, filled with dramatic scenery, active volcanoes and very few people. Only 300,000 in the entire country. That’s hardly as populous as a large town. They elect a president, but he’s more like a mayor. Icelanders are justifiably proud of their country, but on occasion stray into “proud parent” territory, where they just cannot resist gushing about their precious, precautious offspring. They openly talk about “the crisis” here. A lot. They were hit very hard and life has changed dramatically for them. But at least they fired their bankers; we gave ours bonuses. Their money also took a hit (See above). While we were there, Icelandic Kronas were 200 to the pound (or 128 to the dollar). It’s sort of like currency, only worthless. Their water comes directly from natural springs. It is the best tasting water I have ever had. They are very proud of it and hand it out free in restaurants. If you visit, drink it; it really is good and it is the only thing you will get for free in Iceland. 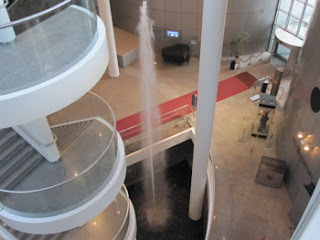 The hot water also comes directly from the ground. It is rich in minerals, velvety soft and smells of rotten eggs. They are very proud of this, too. (The minerals and velvet soft part, not so much the rotten egg part.) It really is fine water, but after you take a shower you smell like rotten eggs for a while, which is handy if you need to sneak a fart. 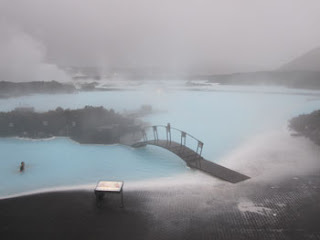 This is the Blue lagoon, where you can swim in warm mineral waters in a large, lavish lagoon. It is a must-do if you visit Iceland. Our tour included a dip in this wonderful water. Let me tell you, there is nothing like spending the morning with 30 strangers, all of you struggling to hold your stomachs in. This is, believe it or not, a set of water towers; those silvery things at the right of the photo are two of the four huge water tanks. The Icelanders build some astounding buildings around features you normally wouldn’t want to visit. We also visited a geothermal power station that was equally lavish and visitor-friendly. A view of Reyjavik from the observation deck off of the restaurant in the water tower. 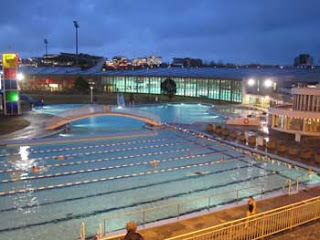 There are many pools, both outdoor and indoor, in Iceland. 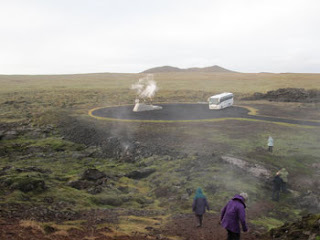 All of them are heated with geothermal energy and people flock to them. Swimming is the second most favourite pastime of the locals, handball (no, not the kind you’re thinking of) is first. This was taken at about 10:30 AM. 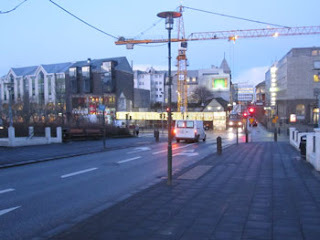 Downtown Reykjavik at about 11 AM. 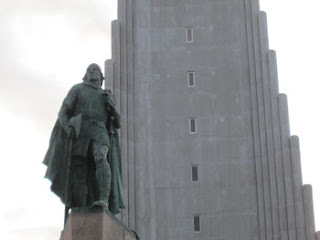 Leif Erikson, the Viking who discovered and colonized America 500 years before Columbus. 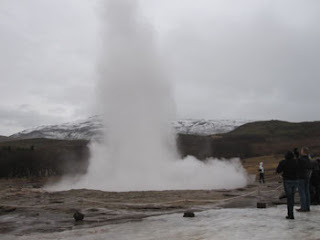 A visit to the Geysers; another must-see. One of the many striking vistas in the interior. This is one of the lava fields. It is not foggy, that is the ground smoking. The strange object in the background is a pumping station pumping super-heated water (300 degrees C) for the geothermal power stations. One of the many dramatic views from the coastline. 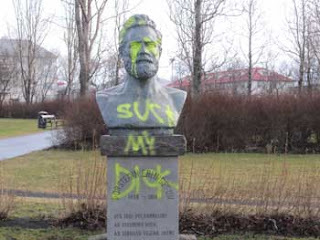 Iceland has one of the highest literacy ratings in the world, and this is the best they could do graffiti-wise. Must try harder. 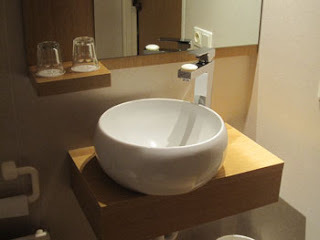 They seem quite fond of this style of sink in Reykjavik. They are rubbish. As you can see by the cake of soap balanced on the faucet, they are not shaped as God intended. Do you want to know the worst thing about being trapped inside the flat all day like some petty criminal with an electronic leg tag? I have nothing else to do but listen to the radio, and what I hear on the radio is often so incredibly insane it makes my head hurt. During this crisis, I have been quite critical of the clean-up methods, and of a group of local people who are taking the council to task for not doing a better job. Four days after the snowfall, the sidewalks (excuse me, pavements) are still a dangerous morass of snow, ice and slush. The locals thought the council should have cleaned everything up and I was more of the opinion that people should have done more themselves. In New York, if you have a sidewalk (in New York, they are ‘sidewalks’) running in front of your home or business, you go out and clean it off as soon as you can. This allows pedestrian traffic move freely and safely and it greatly assists in the general clean up. In Britain, however, the law is, if you have a pavement running in front of your home or business, and if you clean it off, and someone then slips, you are liable, and you can be sued. On the other hand, if you just leave the snow, ice and slush lying there to trip up pedestrians and send them to the hospital with fractured wrists, broken legs or very sore bums, you are not responsible at all. Can someone, anyone, explain to me how that makes any sense at all? Who is responsible for thinking up this tosh! A. Have these 18,000 soldiers train recruits in order to quickly build up an army of tens of thousands of well-trained soldiers? B. Send your 18,000 well-trained, experienced soldiers headlong into machine gun fire to see what happened? A. Provide supporting fire for the airplanes so they could get in close enough to deliver the coup de grace? B. Try to shoot down your own aircraft so your ship could take credit for the kill? If you gave the blatantly sane answer to either of those questions, then you have no future in British politics. On any level. 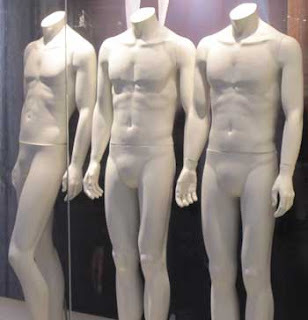 Now, granted, my two previous examples are a bit extreme, and the government no longer enjoys the opportunity to visit mayhem on the populace on that gargantuan a scale but, bless them, they clearly remain dedicated to taking out the population, one slipped disc at a time.